The majority of African Americans derive their African ancestry from the approximately 500,000 to 650,000 Africans that were forcibly brought to British North America as slaves during the Middle Passage [8, 9]. These individuals were deported primarily from various geographic regions of Western Africa, ranging from Senegal to Nigeria to Angola. Thus, it has been estimated that the majority of African Americans derive ancestry from these geographic regions, although more central and eastern locations also have contributed [10–12]. Recent studies of African and African-American mtDNA haplotypes and autosomal microsatellite markers also confirmed a broad range of Western Africa as the likely roots of most African Americans [4, 13]. Although the application of high-density genotyping to a broad range of worldwide indigenous populations has not yet been accomplished, an important first step has been achieved through the recent genotyping of the Human Genome Diversity Panel (HGDP). This effort resulted in nearly 1,000 subjects from 51 populations being genotyped at more than 500,000 polymorphic sites [17, 18]. These data now provide a basis for finer-scale analysis of the ancestral origins of admixed groups, such as African Americans and Latinos, in addition to enabling the accurate characterization of genetic and evolutionary relationships among these populations. The use of high-density SNP data for ancestral reconstruction presents some unique statistical and computational challenges. To this end, we previously developed analytic techniques for estimating individual ancestry (IA) from multiple populations (frappe), as well as for the reconstruction of ancestry blocks in admixed individuals (saber) by using data from more than 450,000 SNP genotypes [20, 21]. Here, we provide a unique application of saber to identify the ancestral origins of each of the more than 450,000 genotypes in African-American individuals, to reduce the analysis to those genotypes that are exclusively of African origin. We note that 58 of the ADVANCE African Americans were also participants of the CARDIA study and had previously been analyzed with 42 Ancestry Informative Markers . We also used principal components analysis (PCA) to define the genetic structure, and in particular the African genetic structure, underlying African Americans. Another recent study used principal components analysis for the African populations of HGDP, but did not relate those results to African Americans . To our knowledge, the analyses reported here represent the first effort to characterize the African origin of African Americans by isolating the African-derived genome in each African American individual. Principal components analysis of more than 450,000 SNPs, including all populations (Africans, African Americans, and US Caucasians), revealed, as expected, a major separation between the African and U.S. Caucasian populations along the first principal component (PC1), whereas the second principal component (PC2) led to the separation of the various African groups (Figure 1). The two pygmy populations (Biaka, Mbuti) and the San of South Africa are well separated from the other African groups, whereas a greater genetic affinity appears to exist between the Mandenka of West Africa, the Yoruba of Central West Africa, and the Bantu speakers, who derive from Kenya and Southwestern Africa. It is also clear in Figure 1 that the African Americans lie on a direct line between the European Americans and the West Africans, reflecting their varying levels of admixture between these two ancestral groups. These results were confirmed in the estimation of IA by using the program frappe (also in Figure 1). The amount of European ancestry shows considerable variation, with an average (± SD) of 21.9% ± 12.2%, and a range of 0 to 72% (Table 1). The largest African ancestral contribution comes from the Yoruba, with an average of 47.1% ± 8.7% (range, 18% to 64%), followed by the Bantu at 14.8% ± 5.0% (range, 3% to 28%) and Mandenka at 13.8% ± 4.5% (range, 3% to 29%). The contributions from the other three African groups were quite modest, with an average of 1.7% from the Biaka, 0.5% from the Mbuti, and 0.3% from the San. In the bar plot of frappe estimates, individuals (vertical bars) are arranged in order (left to right) corresponding to their value on the first PC coordinate. Clearly, this order correlates nearly perfectly with a decreasing proportion of European ancestry (Figure S1 in Additional file 1). Thus, the most important source of genetic structure in African Americans is based on the degree of European admixture. As a validation of the accuracy of this partitioning procedure, we performed PCA on the combined set of U.S. Caucasians, Africans, and the African Americans with putative non-African-derived genotypes removed (that is, coded as missing). For comparison, we also examined the results of the same analysis, but including all of the genotype data of the African Americans. For these analyses, we included only the three African population groups that, based on the first analysis, contributed significantly to the African Americans (the Mandenka, Yoruba, and Bantu). As shown previously, when all genotypes are included, the African Americans lie intermediate between the Africans and European Americans, at varying distances based on their degree of admixture (Figure 2a). By contrast, when only the putative African-derived genotypes in the African Americans are included, the African Americans now cluster tightly with the Africans (Figure 2b). This result provides confidence that the application of saber has enabled us to partition accurately the genomes of the African Americans with regard to European versus African ancestry. We then characterized the African ancestry in African Americans by performing PCA and estimating IA with frappe by using the U.S. Caucasians, Africans, and African Americans, with non-African genotypes removed. To determine whether we could distinguish the African populations from one another, we first ran frappe including all the 94 African individuals (setting K = 6). This unsupervised analysis unambiguously separated the San and Pygmy populations from the West Africans and, to a lesser degree, the three West African populations (Yoruba, Mandenka, and Bantu). To be confident in the groupings of the West African population, we performed a series of leave-one-out frappe analyses that include 57 individuals from the three West African populations: in each frappe run, we fixed all individual within their respective populations except for one, whose ancestry was allowed to be admixed and estimated (see Methods). Results are given in Figure S2 in Additional file 1. The close genetic relationship of these three groups is evidenced by the imperfect ancestry allocation to an individual's own population. However, in every case, frappe assigns the majority ancestry to an individual's own population, and in most cases, the large majority. The Bantu appear to have closest ancestry to the Yoruba. This is consistent with the Nigerian origins of the Yoruba and the presumed origins of the Bantu from the southwestern modern boundary of Nigeria and Cameroon , and the subsequent migration of the Bantu east and south [5, 25]. Figure 3 displays the PCA results of the African Americans and the three closely related African populations (Yoruba, Mandenka, and Bantu). Several features are worth comment. 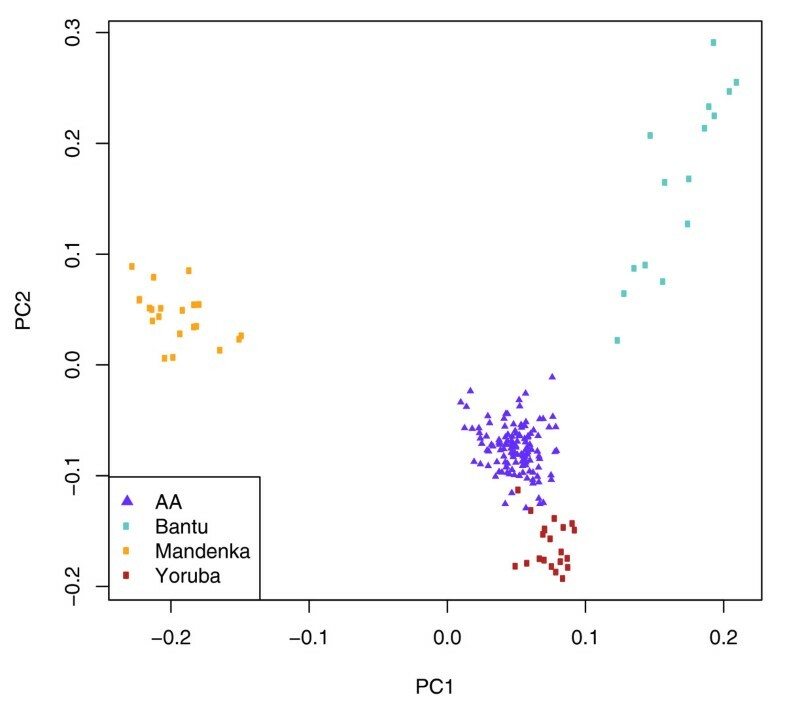 First, despite their genetic similarity, PCA shows clear separation among the Yoruba, Mandenka, and Bantu populations, based on the first two PCs. Second, Figure 3 reveals that the African Americans are placed as a single cluster in the convex hull defined by the three African groups. Figure 4 presents the results of the frappe analysis of the 128 African Americans, in which the six HGDP African populations and Caucasians from ADVANCE were included in the analysis as fixed groups, and proportional ancestry estimated for the African Americans. Consistent with Figure 1, Figure 4 shows that all African Americans are estimated to have significant ancestry from each of the three West and Central West African groups (Mandenka, Yoruba, and Bantu), with only modest variation among individuals in their ancestral proportions from these three groups. As expected, little to no European ancestry is estimated in this frappe analysis. Table 1 provides the averages and standard deviations of IA derived from the frappe analysis described earlier (Figure 4) for the African components of African ancestry for the 128 African Americans. Overall, we estimate within-Africa contributions of 64%, 19%, and 14% from Yoruba, Mandenka, and Bantu, respectively. The variances for the various African IA components are much smaller than those for the European IA and are roughly similar across groups (SD ranging from 0.038 to 0.049). These observations are consistent with visual inspection of the bar chart in Figure 4, that African Americans generally derive substantial ancestry from all three West and Central West African population groups. We also note from Table 1 that no significant differences exist among African-American subgroups defined by U.S. region of birth, in terms of IA estimates for any African ancestral component, nor are any significant differences in IA found, based on gender (data not shown). Figure 5 shows the PCA restricted to African-derived genotypes within the African Americans. In this case, each PC accounts for a very modest amount of variance, and no clear pattern is evident. The distribution of the proportion of variance explained by each PC revealed a continuous distribution with no outliers (data not shown). Prior studies focusing on mtDNA and Y chromosomes have found a greater African and lesser European representation of mtDNA haplotypes compared with Y chromosome haplotypes in African Americans, suggesting a greater contribution of African matrilineal descent compared with patrilineal descent [6, 7]. For example, Kayser and colleagues  estimated that 27.5% to 33.6% of Y chromosomes in African Americans are of European origin, compared with 9.0% to 15.4% of mtDNA haplotypes. Our results are based on examination of the entire autosomal genome and, therefore, provide a more-robust picture of the admixed African ancestry of individual African Americans compared with prior analyses, which focused on only a single locus (mtDNA or Y chromosome). We found all African Americans in our sample to be admixed, with representation from various geographic regions of Western Africa. The amount of variation in the African components of ancestry among the African Americans was quite modest, suggesting considerable similarity in African genetic profiles among African Americans. Thus, African ancestry testing based on a single locus, such as the mtDNA or Y chromosome, as is commonly done by ancestry-testing companies, provides only a very limited, and in many cases, misleading picture of an individual's African ancestry . All ADVANCE subjects were recruited from the membership of Kaiser Permanente of Northern California. Among the 136 African Americans, 49 (36%) were affected with CAD (with first presentation at younger than 45 year for male and 55 years for female subjects), and 36 (26.4%) were male subjects. Of the 87 controls, frequency matched by age to the cases, 58 represented participants in the Coronary Artery Risk Development in Young Adults (CARDIA) study originally recruited at the Kaiser Oakland field center who attended the study's Year 15 examination in 2000 to 2001 [19, 34]. For 76 (55.9%) of these African-American individuals, we had information on state of birth, with 58 stating they were born in the West (California), 12 in the South (Alabama, Louisiana, Mississippi, Virginia), four in the Midwest (Indiana, Michigan, Missouri, Ohio), and two in the Southwest (Texas). The description of recruitment of these subjects can be found elsewhere . Genotype data were derived from two different research projects. The HGDP individuals were genotyped on the Illumina 650 K Beadarray; experimental protocol and SNP quality-control analysis for the HGDP project and genotyping results were described previously [18, 36]. In total, 938 individuals and 642,690 autosomal SNPs passed all quality-control criteria. Genotype data for U.S. African American and Caucasian individuals were obtained from the ADVANCE study, in which genotyping was performed on the Illumina 550 K Beadarray by the same group of investigators, followed by identical quality-control analysis. After removing markers that were absent from either the HGDP dataset or the ADVANCE dataset, the final combined genotype dataset for all analyses in this study consisted of 454,132 autosomal SNPs. We performed PCAs according to the algorithm described by . 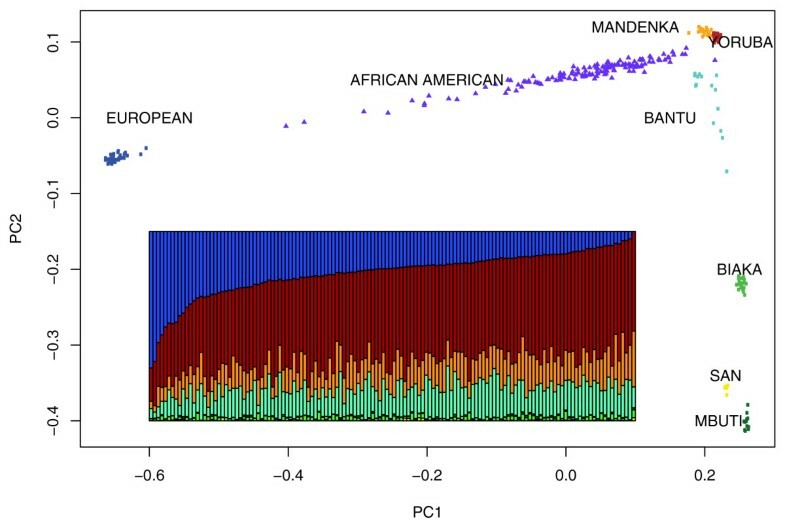 Genome-wide European admixture proportions in African-American individuals were estimated by using the program frappe, which implements an Estimation-Maximization (EM) algorithm for simultaneously inferring each individual's ancestry proportion and allele frequencies in the ancestral populations . In this analysis, ancestry of the African Americans is allowed to have come from any of the K = 7 ancestral populations: San, Biaka Pygmy, Mbuti Pygmy, Mandenka, Yoruba, Bantu, or European. Ancestries of the indigenous African individuals and U.S. Caucasians were assumed to be homogeneous and fixed. However, to determine the robustness of these assignments for the closely related West and Central West African populations, we performed an additional frappe analysis on just these groups (Mandenka, Yoruba, Bantu; n = 57). We fixed all individuals in their respective population groups (Mandenka, Yoruba, or Bantu), except for one, who was allowed to be admixed, and the admixture was estimated. This procedure was repeated 57 times for each individual, so that each person's potential admixture was estimated. In this way, we tested the robustness of the population definitions. If the populations are not distinct, then the individual admixture estimates should appear random; by contrast, if an individual's ancestry is assigned primarily to his or her population of origin, population distinctiveness can be assumed. Furthermore, this analysis provides a closely matched contrast to the African Americans, whose proportionate individual ancestry is estimated in a similar fashion. To focus exclusively on the African ancestral component, we removed genotypes containing European-derived alleles from the African-American individuals by using the program saber. This program allowed us to infer European versus African ancestry for each SNP genotype in an individual . Saber implements a Markov-Hidden Markov Model, which infers locus-specific ancestry based on ancestral allele frequencies at each marker, as well as the ancestral haplotype frequencies between pairs of neighboring markers and assumes a block structure for ancestry along a chromosome. For this analysis, saber required the genome-wide average European ancestry for each admixed individual, which was estimated by using frappe, as described earlier (K = 7). We also supplied the estimated African and European ancestral allele frequencies for all SNPs to saber, which improved the estimation of the ancestral haplotype frequencies. Saber produces a posterior estimate of European ancestry at each SNP, which concentrates near 0, 0.5 and 1, corresponding to 0, 1, or 2 European-derived alleles. Although it is feasible to infer phase and ancestry jointly by using saber, we chose to remove SNP genotypes (as opposed to single alleles) in which at least one allele is European derived. Thus, for a given individual, we were left only with SNP genotypes that were highly likely to be homozygous in African origin. The proportion of genotypes removed for an individual is approximately 1 - α2, where α represents the genome-wide estimate of African ancestry for that individual. As a result, the amount of genotype data varied among individuals based on the degree of European versus African ancestry. To allow adequate information about the African component of their genome, we excluded eight individuals with estimated European ancestry of 45% or greater, leaving a total sample of 128 individuals with at least 30% of their genotype data retained. The proportion of genotypes retained ranged from 31% to 99%, with a median of 67% and mean of 66%. In terms of proportion of genotypes retained at individual loci, the mean is the same as stated earlier (66%), with a standard deviation of 0.05. Thus, assuming a normal distribution, 95% of the proportions of genotypes retained across loci lie between 56% and 77%. We note that even after removing genotypes, a large number of marker genotypes are retained for each individual, with a minimum of 143,025. Additional file 1 contains three supplementary figures. 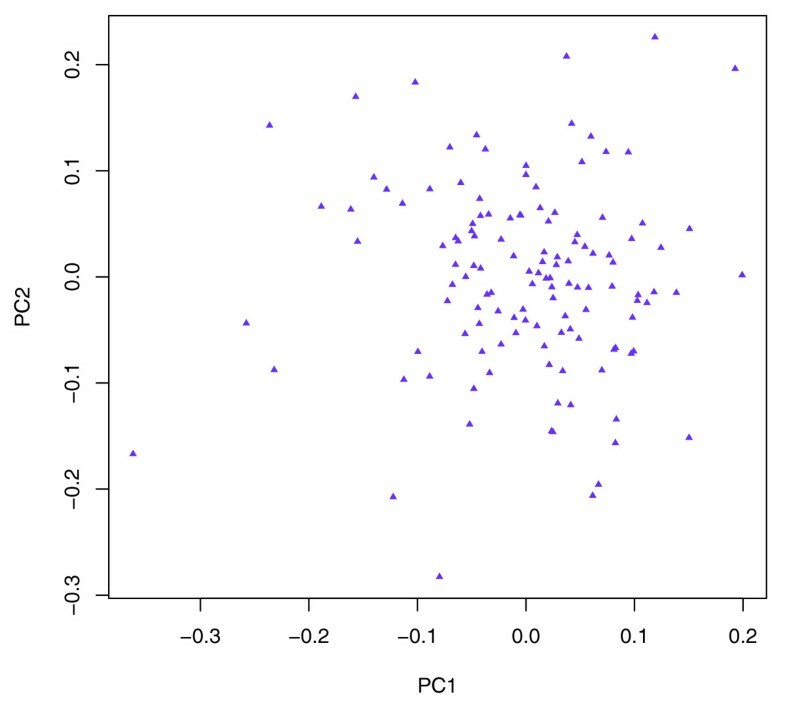 Figure S1 shows PC1 from PCA of African Americans based on all genotype data versus African IA from frappe analysis. The figure shows near-perfect correlation between PC1 and African IA. Figure S2 shows a Frappe analysis of 57 Yoruba, Mandenka, and Bantu speakers, based on estimating admixed ancestry one individual at a time, fixing all others in their defined population. Results show majority assignment to an individual's own population group. 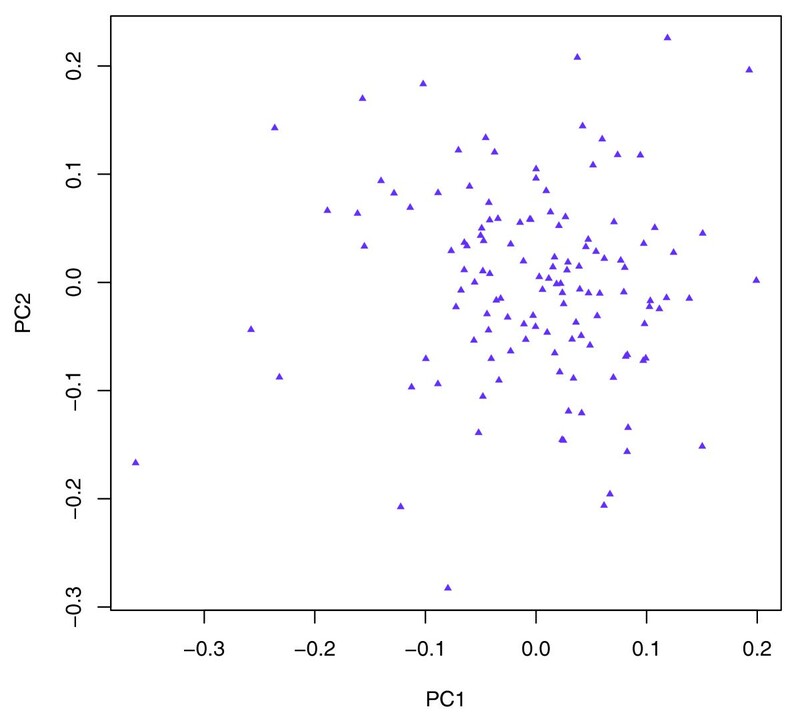 Figure S3a shows a PCA of indigenous Africans (n = 94) based on all genotype data. Figure S3b shows a PCA of indigenous Africans (n = 94) based on variable removal of genotype data. Note that the figure shows nearly identical genetic structure to that in Figure 3a, including the separation of Yoruba, Mandenka, and Bantu.